Louisa May Alcott�s timeless coming-of-age tale became a Broadway musical, opening with Sutton Foster as tomboy Jo who imagines creating fantastic stories while her sisters stay exactly as they are for all time. Tiffini Lopez directs Center Stage Productions� charming and impressive staging of the show, assisted by Tony Wood in designing the large sets that both look good and exude warmth, with Gia Kearns� period costumes nicely completing the picture. Infusing that picture with life is a very talented group � enough of them to have most of the roles split. On the day I attended, Shea Sailors was the singular Jo. A remarkable actress and vocalist, Shea nails the melodrama of her blood-and-guts stories, the tomboyish personality, and the yearning to hold onto the life she has in her youth. She also matures nicely as time slowly steals her former life away, as seen so poignantly in her duet with Beth of Some Things Are Meant to Be. 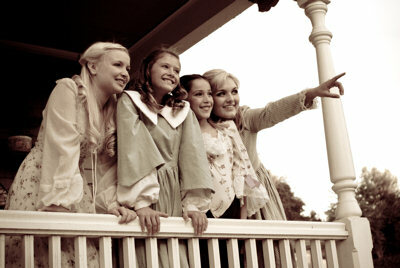 Joining her are her three sisters including ten-year-old Ava Parisi as the sweet Beth. Working with Kyle Williamson as their gruff, elderly neighbor Mr. Laurence, they amazingly and beautifully use their short duet Off to Massachusetts to build a deep and touching relationship. Twelve-year-old Bridget Stephenson is a particularly obnoxious Young Amy before growing into Jaime Ranejat who seems very much like what an Adult Amy would grow into. Julie Burlington makes the potentially pass� role of older sister Meg humorous and charming as she enjoys the company of her sisters and looks to the company of the man she�ll marry (Robert Coe as Mr. Brooks). A few other good performances include the nice vocals of Summer Blilnco as their mother Marmee, Ben Henson as a likeable and sympathetic Laurie dealing with unrequited love, Sam Robinson as the professor who befriends Jo (and gives a hilarious response when Marmee catches him kissing Jo), and Chrissy Wood as a grouchy Aunt March who shares a humorous scene with Jo as the latter awkwardly attempts to demonstrate some affection to her standoffish aunt. The ensemble shines as dancers at the ball and in the blood-and-guts reenactments of Jo�s early stories, enthusiastically and amusingly choreographed (Andrea Shoquist) and portrayed by the actors as they depict Louisa May Alcott�s horror stories before she penned the semi-autobiographical Little Women.